Shortly after midnight on Friday, October 4, 2013, a two-alarm fire broke out at Saint Nicholas Cathedral on East 97th Street. The historic cathedral serves as the cathedra of His Eminence, Archbishop Justinian of Naro-Fominsk, Administrator of the [Moscow] Patriarchal Parishes in the USA. According to New York’s WABC Eyewitness News, two firefighters were hurt battling the blaze, which was contained to the cathedral’s basement and took two hours to get under control. Twenty-five units and over 100 firefighters were called to the scene. The cathedral has a long and venerable history. 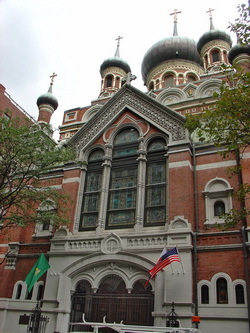 Its cornerstone was blessed in 1901, during Saint Tikhon’s tenure as Bishop, and later Archbishop, of North America and the pastorate of Saint Alexander Hotovitzky. The cathedral was consecrated the following year.